If you want to know how to learn Norwegian in 3 months, the answer is this: time persistence and patience. It helps to have 5 hour practice sessions everyday. If you follow a routine with daily five-hour practice sessions, or a routine where you have as many 5 hour practice sessions as you can, you will get pretty far with Norwegian in a surprisingly short amount of time. Three months will pass quickly and, before you know it, Norwegian will be very, very familiar to you. Another way of how to learn Norwegian in 3 months is to study various aspects of the language. For example, you must study grammar, pronouns and question words. It also helps to study Norwegian culture and the mindset behind the language. You should read Norwegian publications on a regular basis to practice reading comprehension. It is also a very good idea to watch and listen to as much Norwegian media as possible so you can build up your listening comprehension. Learning about the history of Norway and its regional dialects is also a very important component to learning the language. This is because of the fact that there are a lot of regional dialects in Norway that are noticeably different. If you are a native speaker of English who is trying to learn Norwegian, you are in luck. Norwegian is a Germanic language and has much of the same feel as English. Many words are the same and/or sound the same. Norwegian also has words in common with other languages. The amount of words that Norwegian has in common with other languages depends on which language you are comparing Norwegian to. For example, Norwegian has so much in common with Danish and Swedish that the speakers of all of those languages have a relatively easy time understanding each other. Norwegian also has common words with languages outside of Swedish and Danish. However, don’t let this discourage you from getting some good practice conversations from Norwegian speakers. Talk to people in Norwegian. Don’t let the idea that “they all speak English” haunt you and make you feel awkward about outwardly attempting to speak Norwegian. You may actually strike up good practice conversations with people and have some fun experiences. Even though Norwegians tend to be fluent in English, it may still be more polite to speak in their language and to only start speaking English when they say or imply that they like to, or want to, speak in English. There are a few odd letters in the Norwegian alphabet that look and sound a bit odd. However, the language flows pretty well for an English speaker. There are a few strange-looking letters, but the way that they are spoken are not really too strange or far off for an English speaker. One can even argue that there are less strange, far off sounds than in German. The language is pretty straight forward. It uses the same alphabet as English, only with some added letters. If you compare Norwegian to Japanese, Norwegian would most likely come out as the quickest and easiest to learn for an English learner. In Japanese, you have to learn an alphabet for native words, an alphabet for foreign words and a seemingly unlimited alphabet of characters derived from Chinese. Norwegian nouns, pronouns, definite articles and indefinite articles are affected by gender. This is very interesting because the languages that usually seem to get the most attention for this are Latin languages such as Spanish. However, Germanic languages also do this, too. In Norwegian, the gender of a noun is not as clear cut as it is in Latin languages like Spanish. In Spanish, there is a usual pattern of male words ending in “o” and female words ending in “a”–perhaps with some exceptions. In Norwegian, you just have to know which words are male, which words are female, and which words are neuter. However, since Norway is full of different dialects that are grammatically different, words are given different genders in different regions. For example, in some regions people do not assign female value to words and give female nouns definite and indefinite articles that are not female. Bokmal and Nynorsk. Ninety percent of the population uses Bokmal, while only ten percent uses Nynorsk. However, “Bokmal” and “Nynorsk” only refer to written language. When it comes to spoken language, people speak regional dialects. There is a trend of the dialect in the Oslo region—a dialect known as “standard ostnorsk”–veering toward becoming some kind of standard. However, people in academia, such as professors, still give lectures in their own regional dialects. The difference between Bokmal and Nynorsk can only be explained by discussing the history of Norway. From the Middle Ages to 1814, Norway was controlled by Denmark. During the time that Norway was ruled by Denmark, anyone who was lucky enough to learn how to read and write did so in Danish. There wasn’t really much of an issue for those individuals because Norwegian and Danish were very, very similar. After 1814, some people wanted to make Norwegian more distinct from Danish. This led to a type of Norwegian that was constructed from studying different dialects throughout Norway that were thought to be tainted the least by outside influences. This type of Norwegian was Nynorsk. However, many people thought that the use of Nynorsk would be too radical of a change. As a result, Bokmal was developed. Bokmal was a version of Danish that was made to be more Norwegian. Over time, both Nynorsk and Bokmal became official languages. 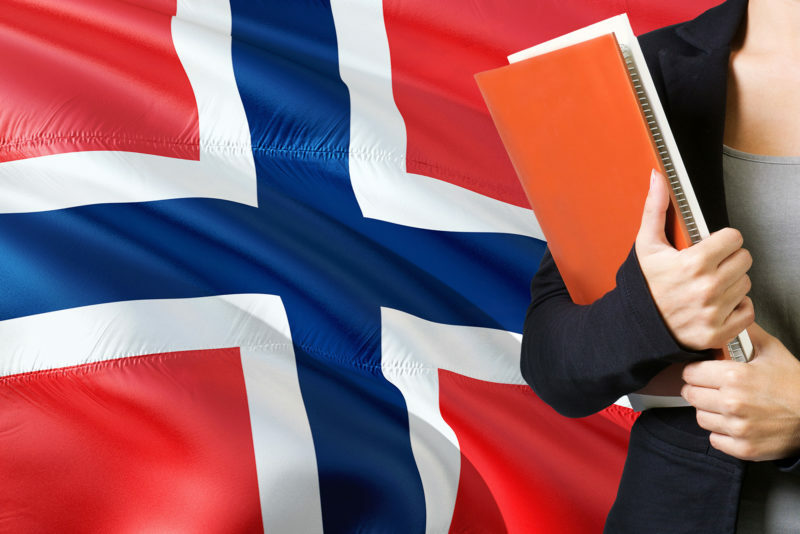 There are some interesting developments that have recently occurred in the Norwegian language. For one thing, there has been an immense influence from English. So, you may hear English words and phrases in Norwegian vocabulary. Secondly, there are so many people who have immigrated to Norway that there are dialects that use words from other languages. The phrase “Kebabnorsk” refers to a dialect of Norwegian that has words from Turkish, Urdu, Punjabi, Arabic, Kurdish and Pashto. So, in your Norwegian-learning journey, you may want to read up on Kebabnorsk. It is quite obvious that the word “kebab” in “Kebabnorsk” most likely is an ethnic reference to the Middle East and India—something that is made more obvious by the fact that it includes words that are specifically from those places.